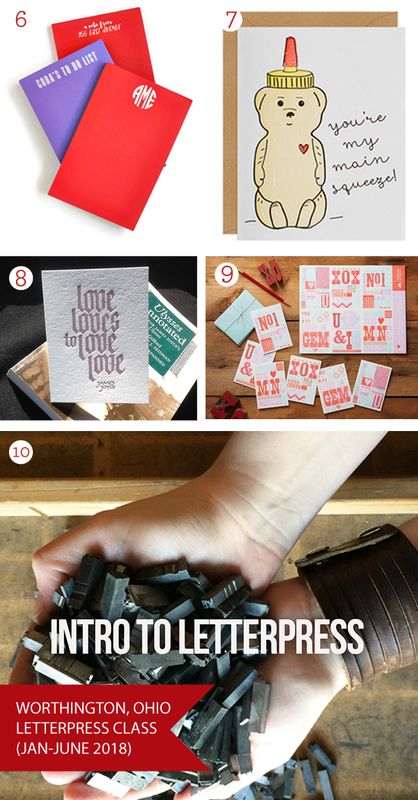 Specially chosen with care, we tally up 14 beautiful, heartfelt, and humorous 2018 Valentine’s Day letterpress gifts, including cards, prints, and letterpress classes (date night, anyone?). Let us know what you are getting your printing paramour this year in the comments below! We are all thankful and proud that letterpress is enjoying such a notable degree of success at so many levels. From one print-person studios to large community print workshops, it’s exciting to think about all the presses that have come back to life for our artisan craft. 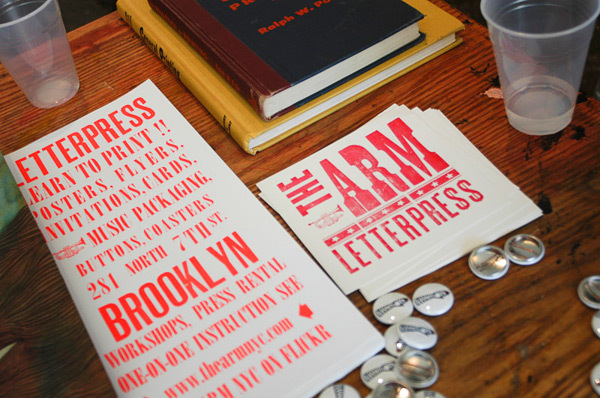 Before this surge in the early 2000’s, letterpress was mostly a small part of university and college printmaking courses. 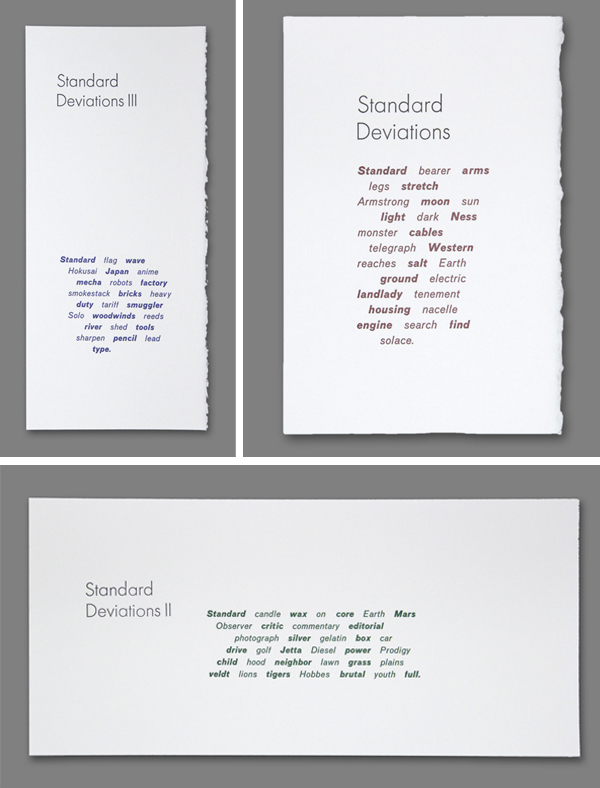 Higher education was where letterpress was happening, quietly and without huge fanfare. 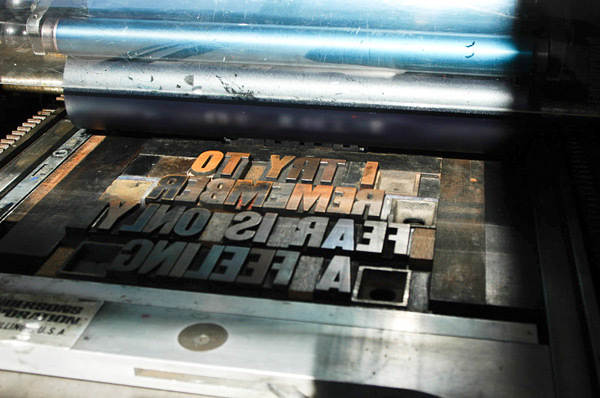 Now, it’s a whole new story and we checked in with some colleges and universities around the country to find out the status of letterpress instruction today. Miami University in Oxford, Ohio — Erin Beckloff of “Pressing On – The Letterpress Film,” also wears a hat at Miami University’s Department of Art, where letterpress is part of the graphic design program. The press shop at Miami University is called Curmudgeon Press. They operate a Vandercook SP-20, C&P Pilot, and Vandercook no. 1 proof press. They also have around nine cabinets of metal type and a large flat file of wood type fonts. The class has been traditional handset combined with some lasercut experiments and lots of linoleum carving for illustrations. Their brand new photopolymer platemaker is going to open up even more opportunities! 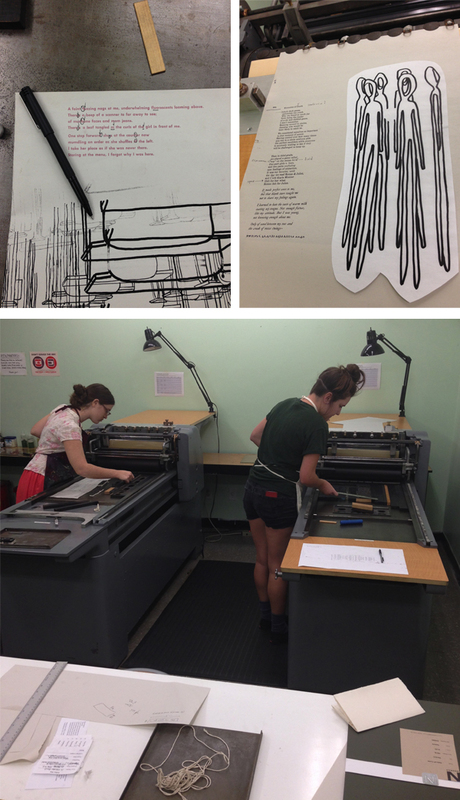 Undergrad and graduate students who use the studio will take Art450, Alternative Design Media: Letterpress. They usually major in Graphic Design, Interior Design, Architecture, Art & Architecture History, Journalism, and Printmaking. Some like Katherine Fries of the University of Indianapolis even went on to create and teach letterpress at other universities. It is hoped it continues to be a diverse mix because the combination of areas of study and approaches to the process produce the most interesting collaborations and work. 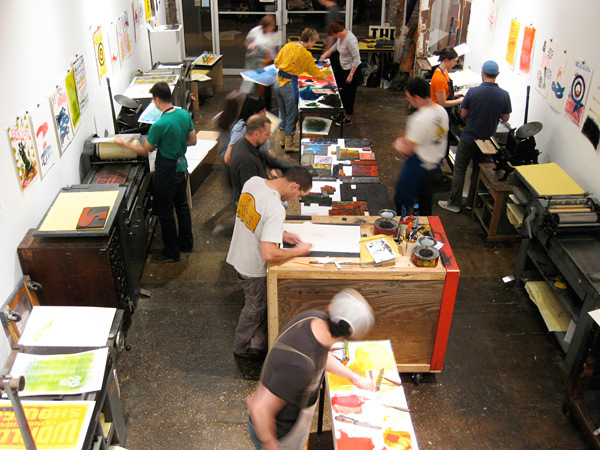 There is a community education part of the letterpress program for non-students. 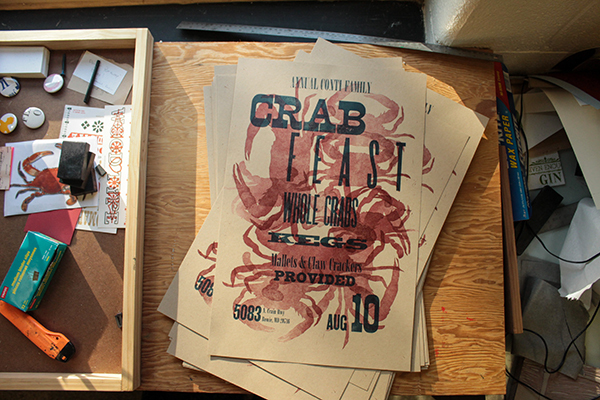 Letterpress has been taught for three summers as a part of CraftSummer, which is open to anyone. It has brought in students from Nashville, Chicago, and all over Ohio — many are K-12 art teachers. Over the past few years Miami University has hosted several Visiting Artists introducing the letterpress community to Miami students and faculty. Kyle Durrie made a stop in Oxford with the Moveable Type Truck; Brad Vetter was a visiting artist, and taught workshops and gave critiques; Scott Moore of Moore Wood Type brings his pantograph for students to learn the history and get to cut wood type themselves; and Chris Fritton The Itinerant Printer will be visiting later this school year. Community exposure to finished letterpress projects include works that have been selected for the annual Best of Class Graphic Design show and less formally, the posters have been used for their original purpose, to promote events around Miami and the broader Cincinnati community. 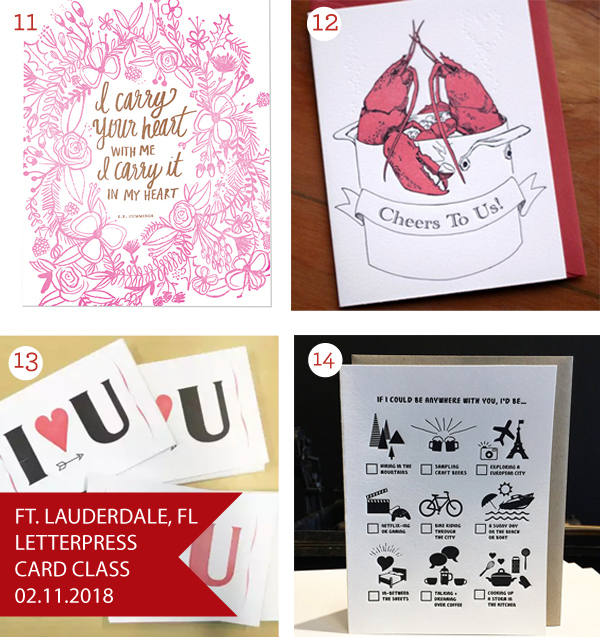 Florida State University – Tallahassee, Florida— Letterpress is a new class within the FSU Printmaking curriculum, and started in the Spring of 2015 under the direction of Denise Bookwalter (Director of the FSU printmaking program) and Allison Milham (former FSU adjunct professor). 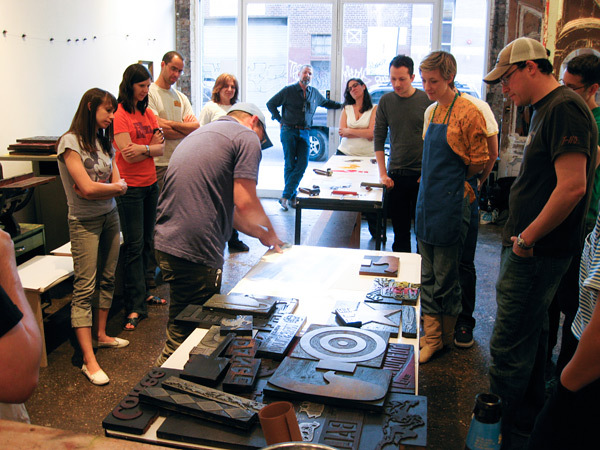 Allison Milham designed and executed the entire letterpress studio, and taught the inaugural class last spring. The class is built around learning traditional letterpress printing techniques (hand-set metal type, etc.) in combination with more experimental techniques (pressure printing, laser etched printing plates, etc.). Students are taught the fundamentals of how the press works, so they can take that knowledge into any studio and find success on any press they come across. 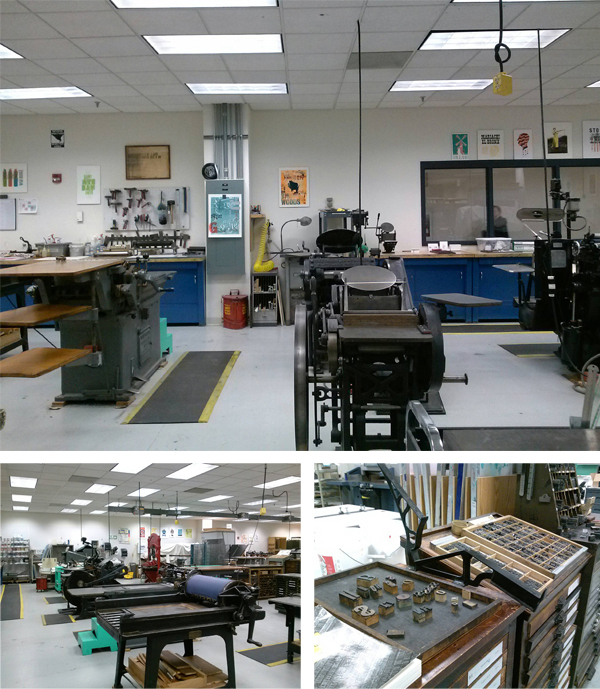 The pressroom has two Vandercook 219s (one is an Adjustable Bed), and one Chandler and Price Pilot Press. 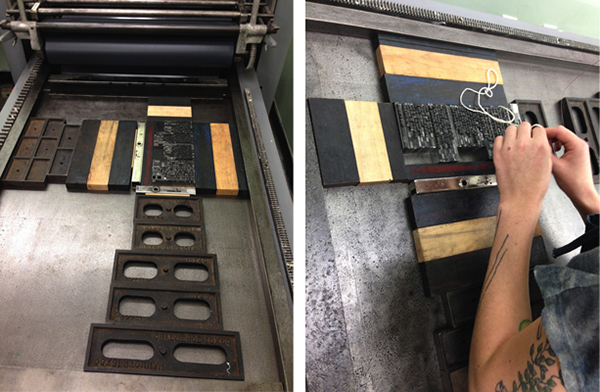 Denise Bookwalter created the letterpress class so that it is open to both printmaking students, and students outside of the printmaking program. Ashley Gorham is teaching a Printed Book class in the studio in which the advanced printmaking students are using the Vandercooks to make artist’s books. For many of her students, this is their first experience with letterpress printing (and look how much fun they’re having!). The programs are still very new but possibly in the future there will be a community education program to broaden the interest and knowledge in letterpress. University of Arizona – Tucson, Arizona — Karen Zimmerman says ASU has a course called Letterpress and the Multiple for graduates and undergraduates. It is an elective in the School of Art. Students can use the facilities for their own projects after they have taken the class or have experience. 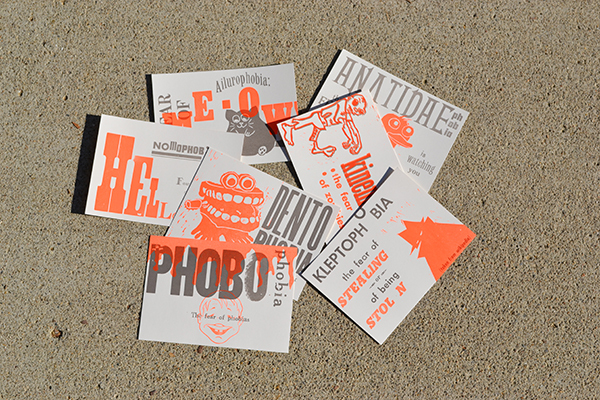 They have a lot of type, cuts, a photopolymer platemaker and digital output for “negatives”. The University of Arizona School of Art has BFA, BA and MFA students. 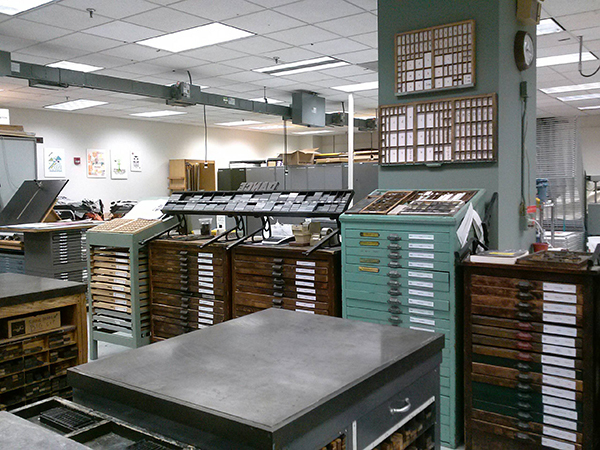 The Letterpress Lab is a couple of blocks north of the campus. The building used to be a restaurant, so the layout and style is a bit challenging, but it does have lots of windows, natural light, and a patio. There are five Vandercooks of varying sizes, three Chandler and Price, one Baltimorean and one Midget Reliance iron hand press (circa 1890). There are 30 students on average and they can continue to use the facilities for projects after their class. Most are School of Art students, MFA Creative Writing students and Book Art Collective members. In addition, there are community workshops that typically take place during school breaks. The letterpress lab at the college is about 10 years old. At first the equipment was used just for projects in a typography course, but the curriculum has grown in scope over the years. 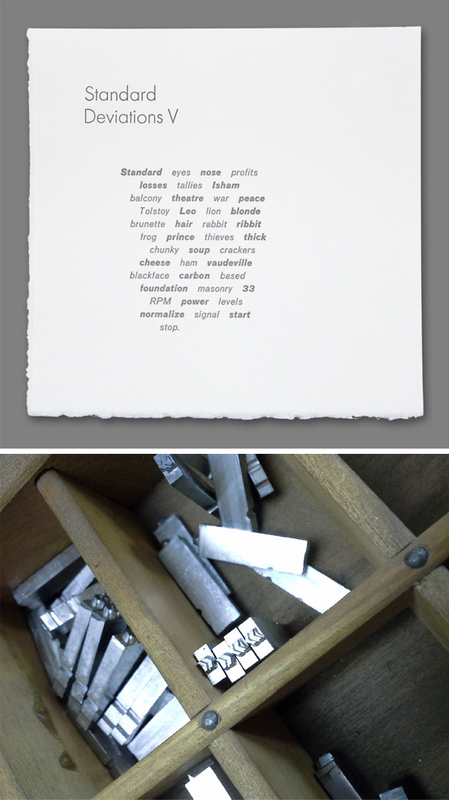 Now letterpress is a stand alone course. School of Art has poster shows in their student gallery showcasing the work from these classes or around visiting artists like Amos Kennedy, Paul Moxon or others. Donations of equipment have led Zimmerman to learn how to move heavy equipment, rent machinery, and fix presses, all due to necessity. Organization has been a huge undertaking and it is still evolving. Social media is also a huge effort to get the word out about the lab and projects. The letterpress studio is slightly off campus in its own building, so it is hard to get people to it and parking can be an issue but it’s an exciting place to print and worth the trouble. Madison College Center For Printing Arts – Madison Wisconsin — Beth Ketter is an Instructor of Graphic Design at The Madison College Center for Printing Arts. The Center also houses wonderful instructors such as Deb Vogt and Dave Stuber and a lab manager, Nick Loveland. They are in their fourth year of offering two sessions each of a 3-credit Principles of Letterpress course and a 2-credit Advanced Letterpress course as electives in their Graphic Design & Illustration Program. The 16-week classes are also open to anyone in the community and capped at 12 students. Typically there are 2–3 instructors present for each class and classes meet for 6 hours per week with 12 to 16 hours of open lab time each week. 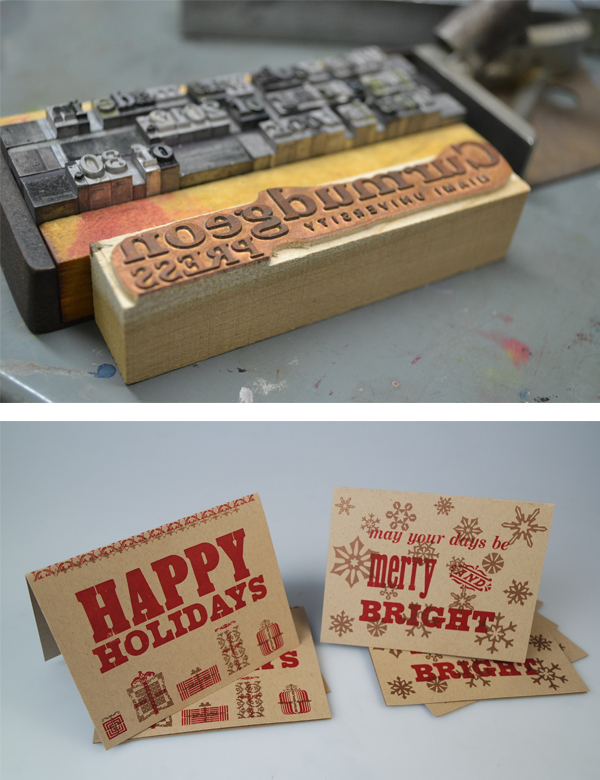 Topics covered include designing for letterpress printing; hand setting metal and wood type; generating photopolymer plates using artwork created using computer graphics software programs; creating linocuts and pressure prints; press maintenance and press set-up. Students also learn how to mix inks by eye and using a scale. Students run projects on a variety of papers and inks and learn how to select the best paper for a project. There are guest-led workshops on special printing topics as well as guest speakers. 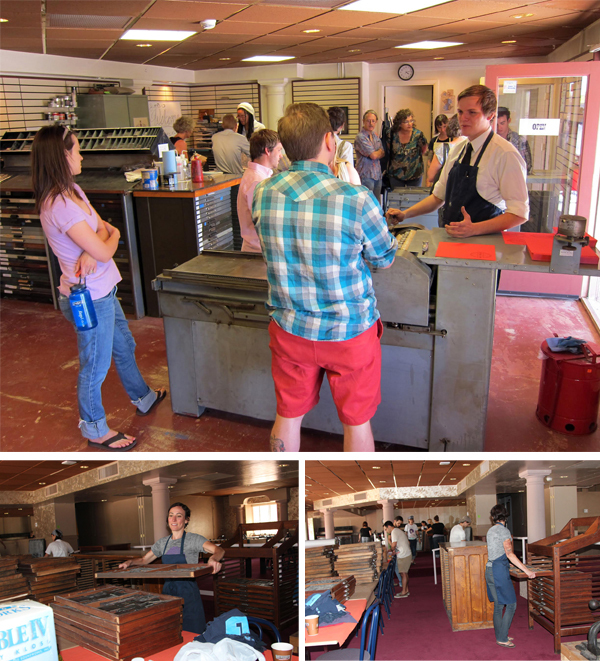 Classes also go on tours/field-trips to tour small and large letterpress businesses and they are fortunate to be close enough to visit the Hamilton Wood Type and Printing Museum. 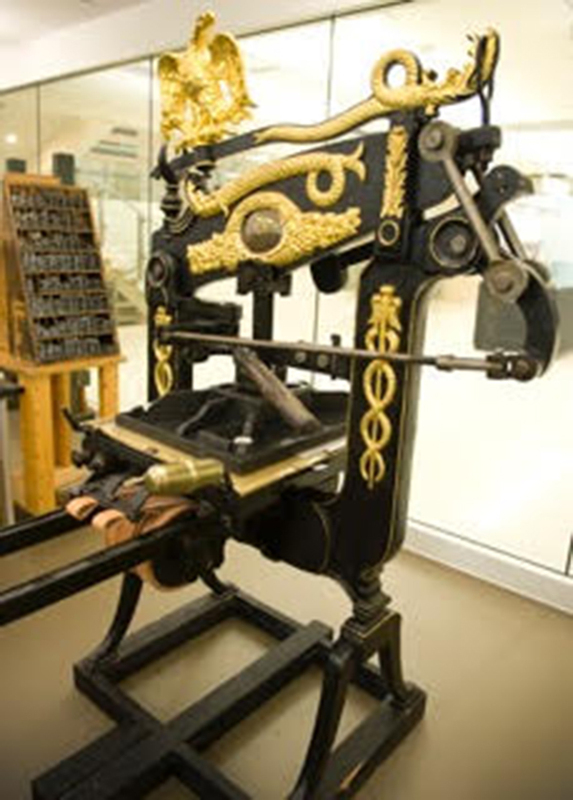 Madison College owns ten presses made up of three Vandercooks; a Heidelberg Windmill; three Chandler & Price platens; a Kelsey Excelsior 5×8; a Washington Hand Press; and a Showcard. In addition, they own a Ludlow, and the lab has finishing and binding equipment, plus two offset presses and screen printing capabilities. Persons of all ages and backgrounds take the classes. The courses are offered as electives to Graphic Design & Illustration Associate Degree students, enhancing their portfolios. They also serve the Madison area where many take the course because of an interest in handmade books, printmaking, and commercial letterpress printing and entrepreneurship. For some students, this may be their first foray into making art. They are just getting into having short term workshops. Over the summer, workshops were held for high school students interested in printmaking and there are many requests for more of this in the future. 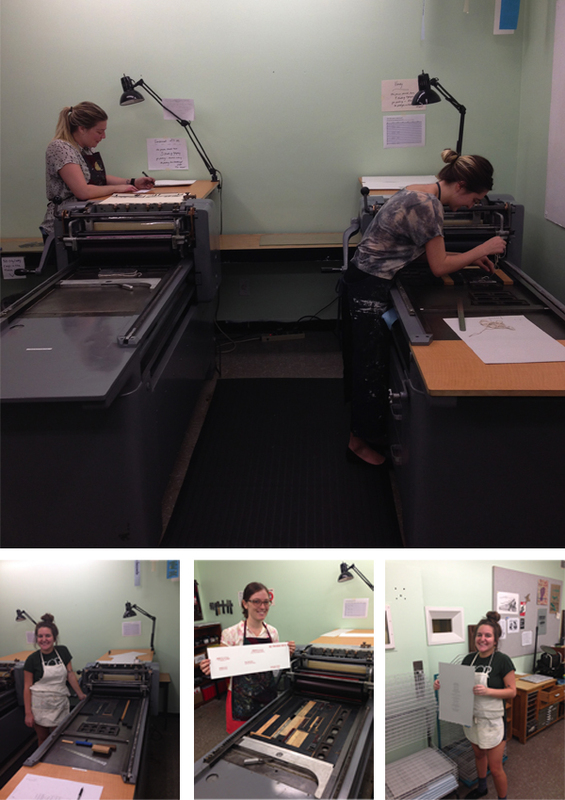 Every semester the Center for Printing Arts has 2–3 pop-up sales where student work is packaged, displayed, and sold. The proceeds help cover the cost of materials. Products include cards, calendars, prints, notebooks, ornaments, hang-tags and other paper goods. They use an iPad for sales and keep track of inventory. This experience also gives students a chance to see how to market their work at craft fairs and other such events. In addition, there is an art gallery which exhibits student-produced prints and they’ve also had shows at local galleries showcasing the students’ work. The Book Arts Program and Red Butte Press at the University of Utah – Salt Lake City, Utah — In 1996, Gene Valentine, who now teaches at Arizona State University and runs Almond Tree Press and Papermill, began teaching summer letterpress intensives to community members. 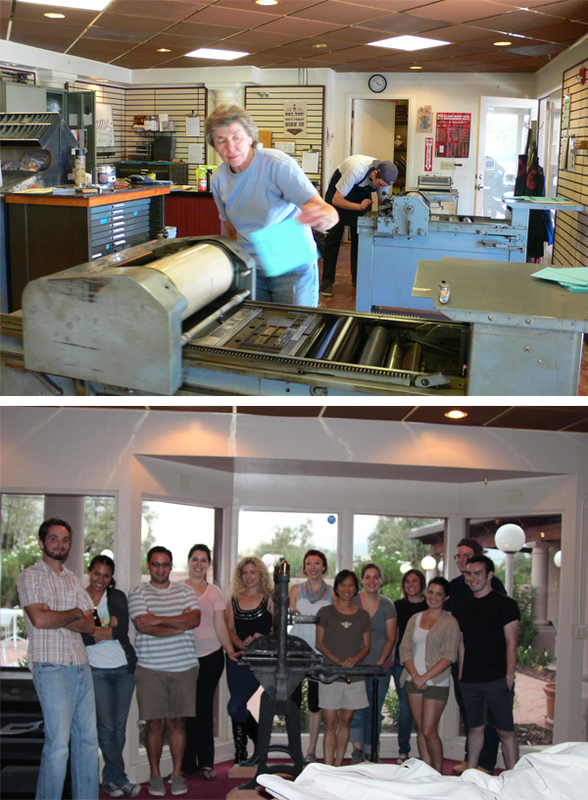 And In 1999, the first academic letterpress class was taught by Chris McAfee. Beginning in 2000, Marnie Powers-Torrey began teaching academic and community letterpress classes. She was joined by David Wolske in 2009. Currently, Crane Giamo and Marnie Powers-Torrey run the letterpress programming. The shop has many, many presses: eight cylinder proofing presses including Challenge, Asbern, and various Vandercook presses; three Chandler and Price platen presses; two iron hand presses – a Columbian and an Albion; four bench-top platen presses, and 15 table-top presses. 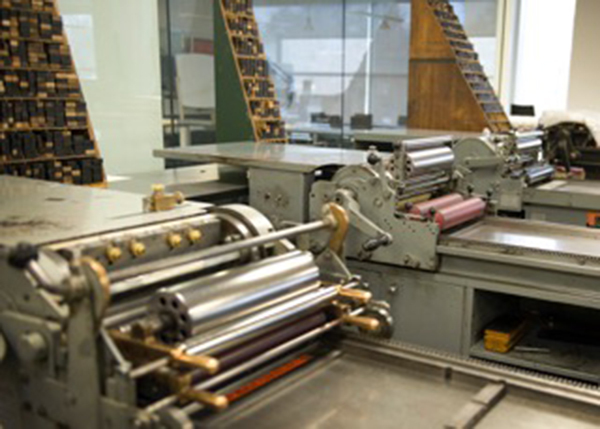 U of U has 2 academic letterpress courses—Letterpress I and Book Arts II, each of which are requirements for students pursuing a Certificate or Minor in Book Arts. 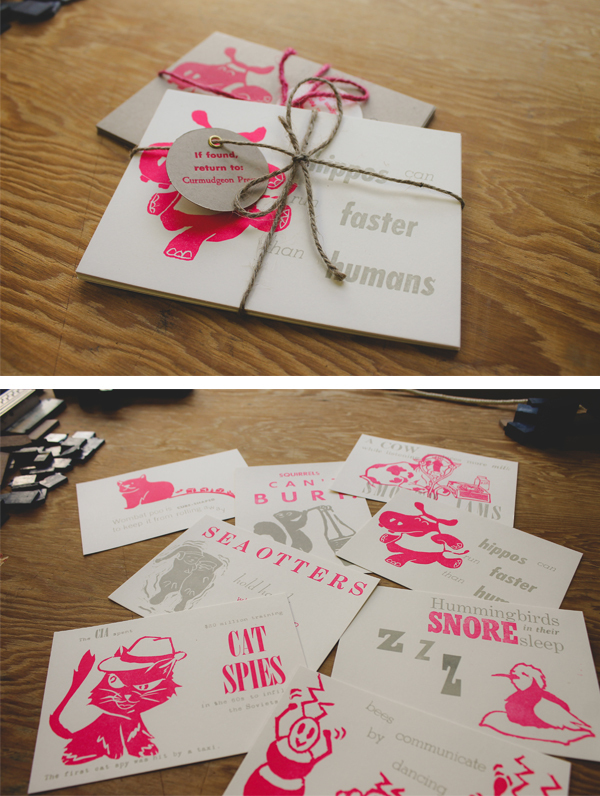 Letterpress I also fulfills the general education Fine Arts requirement. A diverse swath of students take the classes. Graphic Design, English/Creative Writing, and Art students are mainstays of their printing economy. 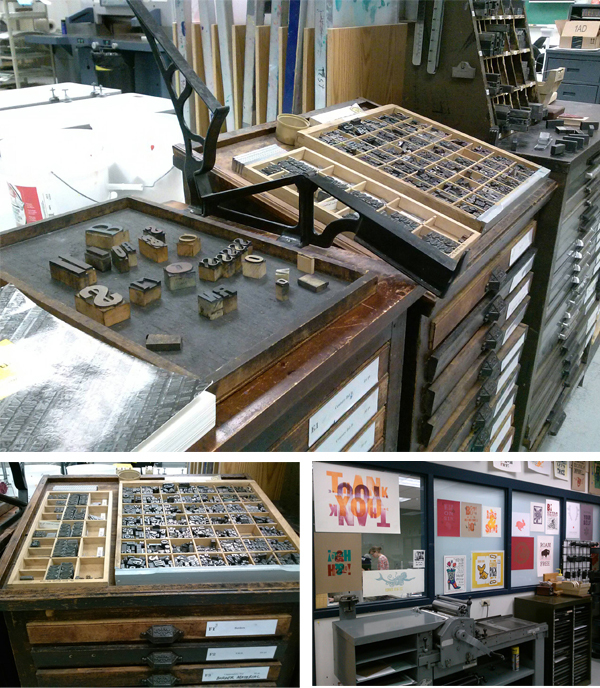 They have 25 students for each letterpress course, 50% of which arrive from the Art and Art History Department. 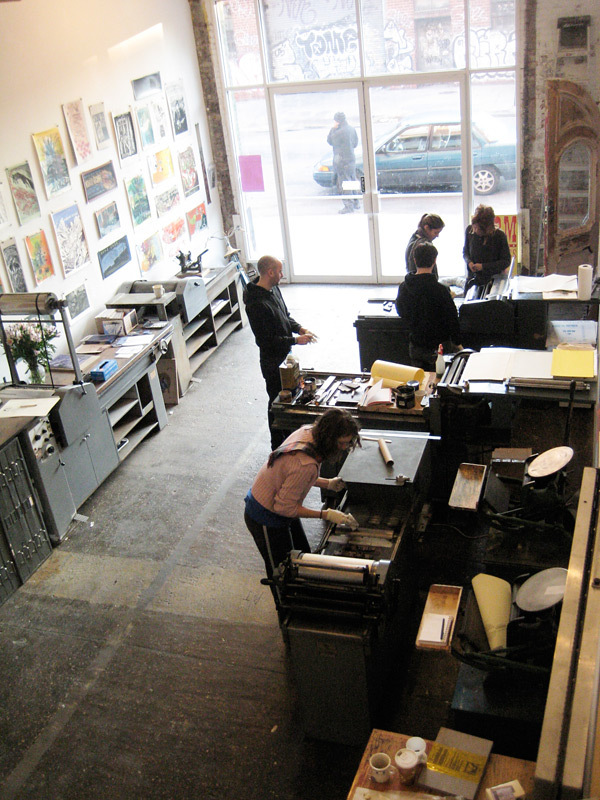 They also attract many independent studio users —community members and former students — who have access to the print shop. 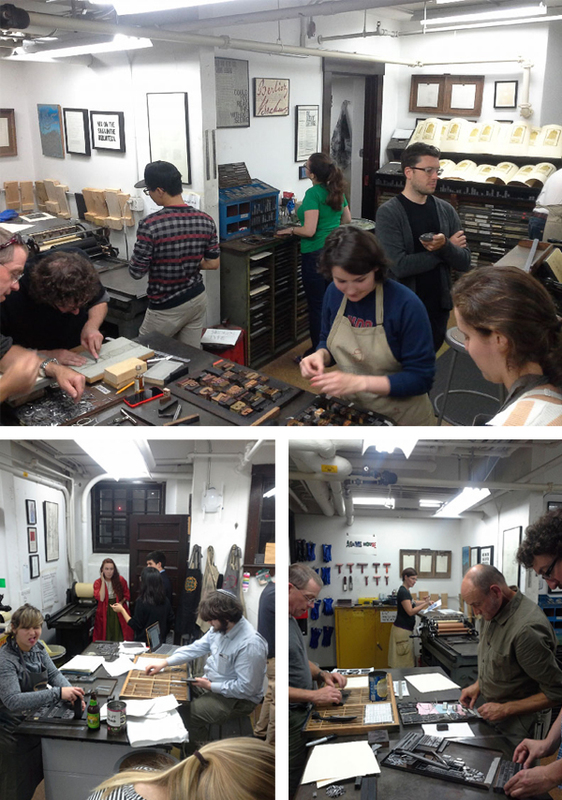 For community members, a multi-session letterpress class is taught for 8 weeks over the summer. As part of this, they reserve two slots of the academic letterpress courses for community members through lifelong learning/continuing education partnerships, and teach several single day and weekend workshops throughout the year. To bring letterpress courses to the school, the idea has been “If you build it, they will come“ — marketing strategy a la Field of Dreams. Also, the school has generated a variety of digital marketing campaigns and community outreach programs. 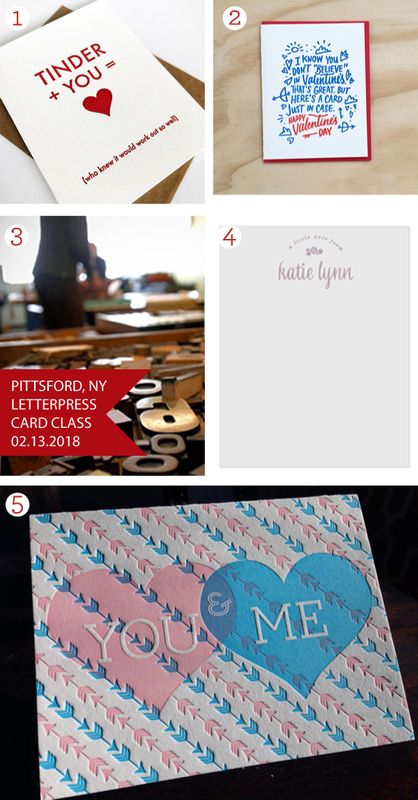 The underlying idea is that CONTENT=PROMOTION, so they curate 2-6 exhibitions per year, all of which feature some aspect of letterpress printing. Currently there are two exhibitions on display, one showcasing work from the Women’s Studio Workshop, the other featuring work from the 14 instructors who will be teaching community workshops throughout the 2016 calendar year. 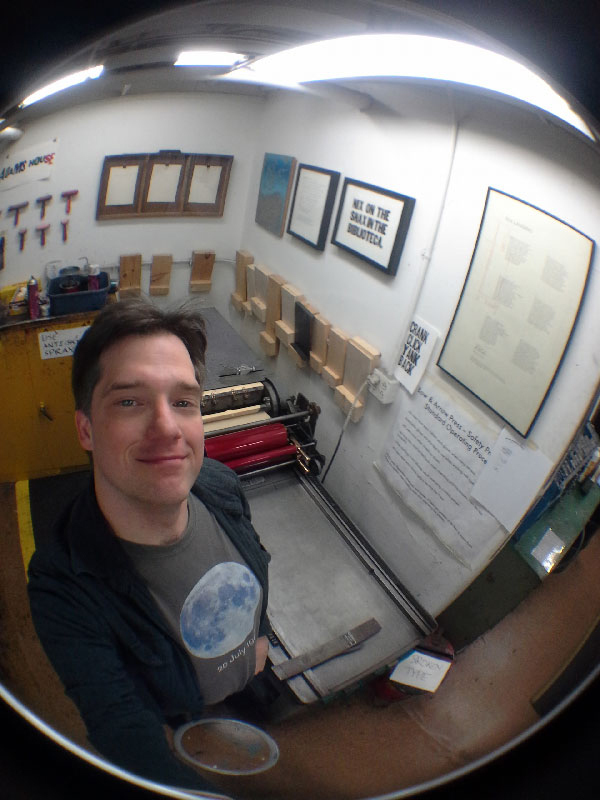 A whirlwind of creative energy, Ted Ollier of the Bow & Arrow Press & Mindhue Studio is a creative tour-de-force who loves blending art & education via letterpress (and with gusto we might add). When he’s not getting students and the letterpress-curious up to speed at the Crash Courses and Open Press Nights found at the Bow & Arrow Press at Harvard University, Ted moves deftly from part-time teaching to pursuing his own fascination with typesetting, designing conceptual artwork, playing bass, and the enjoying the thrill of finding type still wrapped in foundry sealed wax paper. We caught up with Ted amidst the fun to see why the fascination with printing still reigns supreme. PRINTING DEXTERITY I was born in Toledo, moved to Austin during the 80’s Rust Bowl, and moved to Boston in 2008. I have a BA in Liberal Arts from the University of Texas at Austin, a BFA in Studio Art and Communication Design from Texas State University, and an MFA from Massachusetts College of Art. I’ve been a designer, prepress technician, type designer, printmaker, photographer, bass player and artist at various times in my life, sometimes all at once. My BFA concentration was in metalwork and fine art printmaking, and I worked prepress and design in a small offset litho shop in Austin while I was getting that degree. That dual experience — seeing printing both as an art and as a business — definitely has come in handy dealing with letterpress. LOVE AT FIRST SIGHT A friend of mine was running the Bow & Arrow Press, a letterpress shoehorned into the basement of Adams House, a residence hall at Harvard University. When I moved to Boston, he asked me if I’d like to take it over, as he had other projects coming up. I did, and the rest is history. THE PRINTING BEAT IN BOSTON We’re shoehorned into three-and-a-half connected rooms in the basement of the Adams House Residence Hall. Odd corners, protuberances, closets and shelving are just part and parcel of the Bow & Arrow experience. We have a Vandercook No. 4, a Vandercook SP-20, an old Vandercook roller press, a C&P Pilot tabletop press, a Charles Brand intaglio press, and two museum pieces: a C&P windmill press and a Pearl treadle press. The Pearl is, alas, too fragile to run and I don’t really trust the C&P around so many inexperienced people, so they stay quiet. The Charles Brand intaglio press is our most recent addition, donated by a printmaking colleague of mine, and it’s nice to be able to demonstrate forms of printing even more obsolete than letterpress. Our type is old and has not always been handled properly, but that doesn’t stop people from setting amazing things with it. Some of my favorite faces in our collection are a nice selection of Futura Light, a nice selection of Stymie, a case of New Century Schoolbook, and a case of Kennerly Italic. 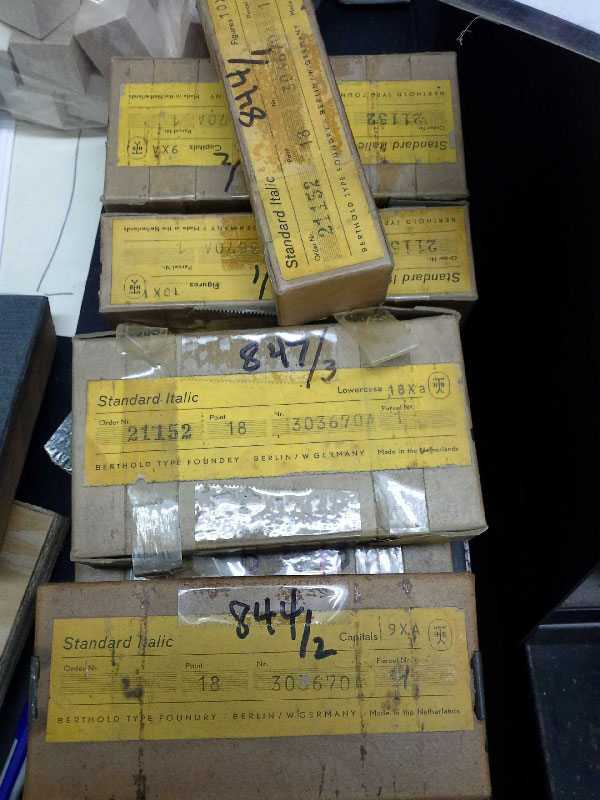 We also have more than 500 printing plates and linoleum blocks in our library. 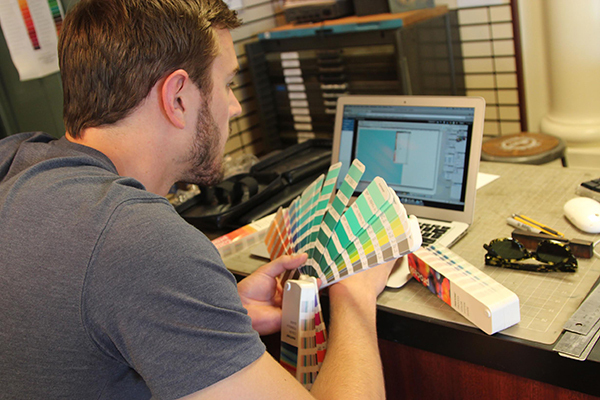 We have the full complement of rubber-based PANTONE inks, and have an uncoated guidebook for mixing custom colors. We use California Wash, NTT type wash, and Super Rubber Rejuvenator. I’ve heard there is some controversy about SRR in letterpress circles, but judicious use over the last five years has kept my rollers looking as smooth and matte as the day we installed them. We have a small manual Challenge guillotine cutter, and the usual complement of composing sticks, pica sticks, leads, spaces, coppers, chases, quoins, keys and other ancillaries. THE CREATIVE PROCESS I’m both a designer and printer. It depends on if it’s for a commercial job or for my own artwork. The commercial jobs tend to be relatively straightforward: legible type, minimum of ornamentation, some judicious color if that’s what the client wants. These days it’s an uphill run explaining the concept of spot color or the limitations of the letterpress to people who are used to immediate CMYKOG inkjet printing, but it usually works out to everyone’s satisfaction. I definitely subscribe to the idea that design is there to facilitate the transfer of information, rather than a chance for an art director to demonstrate some faddish stylization or pointless gingerbread. My own artwork, on the other hand, is heavily conceptual and very intellectual. I spend quite some time tweaking and mulling the concepts that I find intriguing and compelling, and then thinking about what’s going to end up on the paper. That said, I try as best as I can to distill things down so that someone seeing the images for the first time will find them interesting enough to explore the concept further, rather than be put off by a hermetic sterility or ivory-tower isolation. My main intention is to get people to see these ideas in the same fascinating light that I do. This desire to show and share interesting information about the world keeps me from getting too far into outer space — at least that’s what I hope. FULL TIME FUN I also teach part-time, and have a day job doing scanning and Photoshop work, along with some intermittent design. I’ve taught printmaking and intro graphic design, and recently I’ve been able to use the Bow & Arrow Press to teach letterpress and intaglio. That’s wonderful because I’m able to keep the Press busy and engage students in a more formal teaching environment than our informal classes and open press hours. Plus, the heightened visibility of the Press has allowed us to work with people from all over campus, including the Harvard Summer School, the Harvard Extension School, the Graduate School of Design, and the Department of Visual and Environmental Studies. Printing is only one of the several hats I wear, but I’d love to do more of it. PRINTING FEATS When I got to the Bow & Arrow Press, it was somewhat underutilized and chaotic, and although I had printmaking experience, I didn’t have much printing experience. In the last six years, with the help of many of the people who run Adams House, I’ve been able to grow the Press into a bright, busy, organized place. Since we reside in a undergraduate dormitory, we are required to have Open Press Nights where students (and others) can come to see what this obsolete printing process is all about. Through weekend Crash Courses supplementing these Open Press Nights, we’ve enabled the Press to accrete a growing population of people who keep coming to explore not only typesetting, but also bookmaking, relief printing, engraving and drypoint, page layout and imposition, and many other things. Through all of this, and probably because of it, I’ve also been able to find my way toward gaining experience as a letterpress printer. Nowadays, I’m very pleased that I can run multi-color tight-registration jobs with a reasonable throughput on both our Vandercook No. 4 and Vandercook SP-20. PRESS HISTORY The first press I ran was the Vandercook No. 4 that has pride of place at the Bow & Arrow Press. It’s still my favorite. It’s small, but it’s bulletproof, and I’ve been very pleased with the registration I’ve been able to get on what is supposed to be a proofing press. BOXCAR’S ROLE Boxcar Press has been an integral part of this whole thing from the very beginning. I know that letterpress people are supposed to extoll the romance of cold lead type and disown anything digital, but when you’re running a four-color design with modern typefaces, complex line art, and a final emboss, it’s time to examine one’s base assumptions. It’s the final product that really matters. Designers can be just as obsessive with thousandth-em kerning in Illustrator or InDesign as they can be with coppers or brasses, and with OpenType glyph sets, you have more ligatures, swashes and ornaments than you really know what to do with. That’s not to say I don’t bliss out when sitting down to typeset with the font of Standard Italic 18-pt that I found at Letterpress Things in Chicopee still wrapped in foundry-sealed wax paper and binding string, but one has to recognize that there are things that formalized lead typesetting cannot do. Since I have an extensive technical background in prepress, I haven’t needed the help of Boxcar Press in solving problems, tweaking designs, and fixing trainwrecks as other people might, but I think that’s a bonus for both of us. I think of Boxcar just as I did about the service bureau where I used to get film positives and offset printing plates made back in the day: I send you my files, you process my files, you send me my plates, and I run them. No fuss, no muss. In the five years I’ve been using your services, I’ve only ever had one hiccup in the process, and that was dealt with swiftly. I can’t think of higher praise to give. SHOP TIPS Running a Press with a substantial public component takes patience and care. 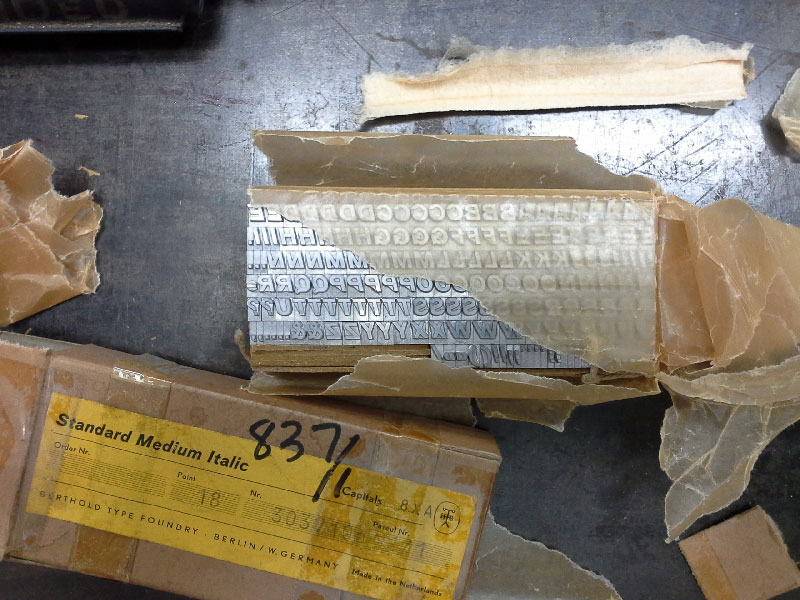 At any given time there are probably three or four people in the shop who have never touched a piece of lead type in their lives. Although I have Student Pressmasters and kindly regulars to help smooth over the bumps, the Crash Courses that I started teaching in 2009 have really kept the worst kinds of newbie mistakes to a minimum. WHAT’S NEXT Recently, some of my regular Open Press attendees and I were able to purchase a Vandercook SP-20 for a joint-use project. We’re still looking around at lease options and way of organizing the business, but our intent is to take some of the lessons learned at the Bow & Arrow and pursue them in an independent venue. Will it become a full-time printing gig? We shall see, as I still love the Bow & Arrow and everything that surrounds it. 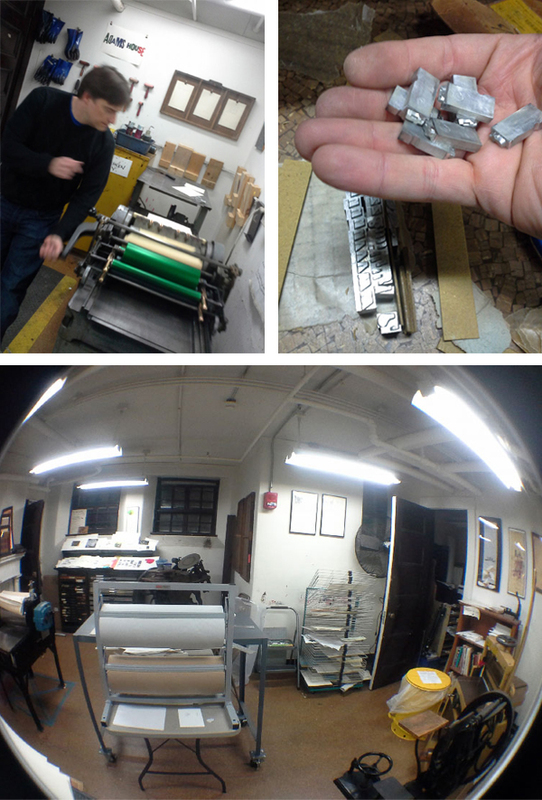 Huge round of thanks to Ted for letting us get a sneek peek at both the Bow & Arrow Press and Mindhue Studio! As studios go, The Arm in New York might be one of the best hidden secrets. If you go before it opens, you might wander up and down this Brooklyn street wondering if you are in the correct location. There is no sign, just some apartments, empty-looking warehouses with metal rolling doors, and a small corner store. The street number is right but still nothing to say “here it is”. But minutes before the 11 am hour, a couple of people wander up. They carry paper and what could be a plastic printing plate. This looks promising. And on the hour, a skateboarder arrives, unlocks the door, rolls up the metal rolling cover to show a big picture window and its welcome to The Arm. Here there are the presses, the notices on the window. The activity begins as many more printers arrive in succession. Daniel Morris of The Arm describes what’s inside. THE PRESSES: I am a bit of a freak for late model Vandercooks. I have two SP-15s, two Universal Is and two Universal IIIs. 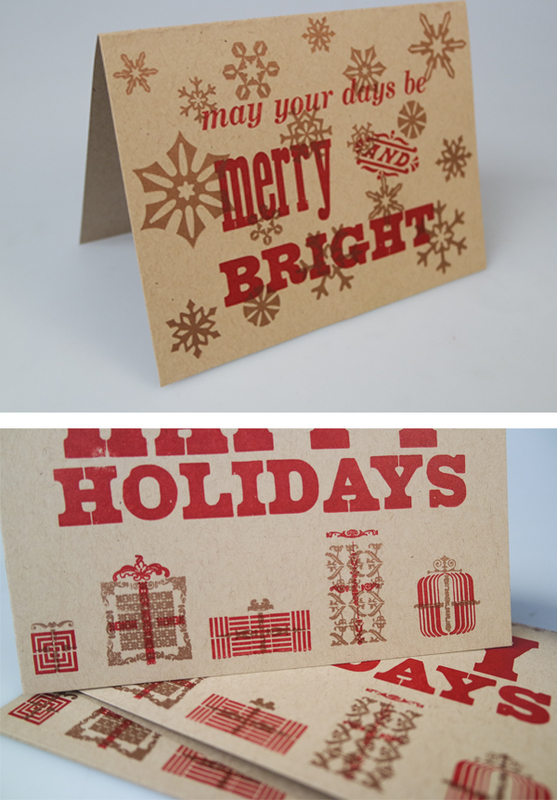 For smaller work there are a couple of C&P Pilots and a Kwikprint 86 foil stamping press. Because I also recondition presses there are often one or two others in some state of restoration at any given time. The equipment has been chosen very carefully to be safe and suitable for a shared work environment. THE LOCATION: The Arm is on the ground floor of a renovated nineteenth century stables building in Williamsburg, Brooklyn. The studio takes up the bulk of the ground floor. I built the glass shopfront so that it opens 8 feet wide — getting equipment in and out is a breeze. 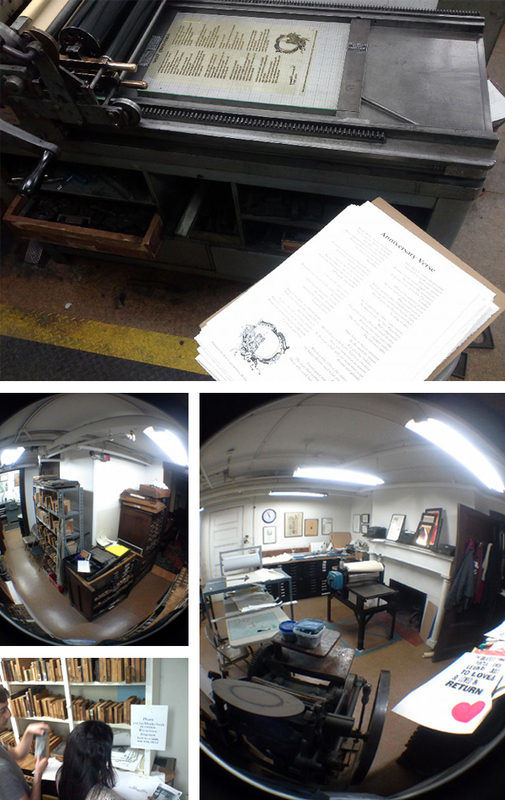 FAVORITE THING ABOUT THE SHOP: The way I have laid out the space, the press room is visible from the street, but the type room is tucked away. This was to make sure that passers-by could see what was going on from the street, but also to make sure that people weren’t too distracted when composing type forms. TYPE OF SHOP: Community + educational. I set it up specifically to be able to share it, my presses and my knowledge of printing. I teach classes from the space almost every week and make the presses available for people to use for their own projects. We’ve got quite a community of printers here in NYC. It is far more fun in the space when there are a few people in working. MOST VALUABLE SHOP TOOL: The trusty .918 roller setting gauge. FAVORITE INK: We use the Van Son Rubber Base Plus system and maintain an inventory of all the base colors for the Pantone mixing system. With these inks, a Pantone book and a scale you can’t go wrong. SOLVENT OF CHOICE: I use Gamsol for washup. It is an artist’s grade mineral spirits. We keep it in Justrite plunger cans and make sure all waste rags end up in our sealed Justrite waste cans. I’m a bit militant about shop safety protocol, MSDS sheets, etc. PLATES AND BASE OF CHOICE: I am very fond of the standard base and the KF95 plates. I don’t like the deep relief plates, but do have a couple of small deep relief bases for people that bring them in. There must be nearly a dozen Boxcar bases here at The Arm. 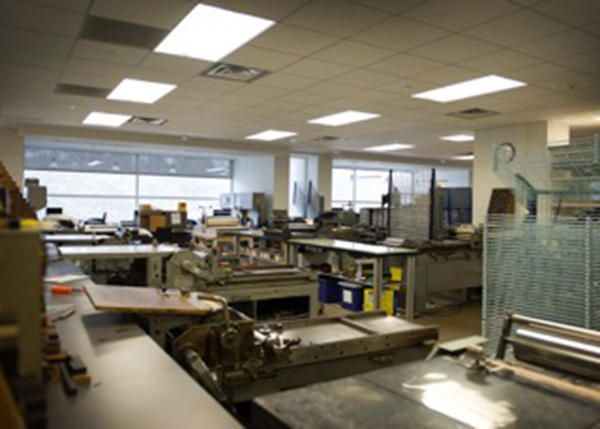 FLOOR PLAN TIPS: Make sure your press is situated where you feel comfortable and have good light. Get yourself a good anti-fatigue mat (I love the 2×6 Uline Cadillac mats for Vandercooks) and your feet, legs and back will thank you. PIED TYPE: I am proud to say my shop has no pied type. As one of the owners of The Dale Guild Type Foundry, I love to work with metal type, but my policy is to sort the good stuff and melt the bad. May as well turn it back into something useful- we can smelt old foundry type to make new type and Linotype metal, Monotype, etc. we give to our machinist to melt down to make fishing sinkers. You’ve got to keep your machinist happy. ORGANIZATION ADVICE: Down time is critical. Sometimes you just need to take everything apart, clean like crazy, and put it all back together. PRINTING ADVICE: Coffee and good records are key [to making the space feel creative and comfortable]. But it is important that the music isn’t too loud that you can’t hear when the press is trying to tell you something. Big round of thanks to Dan Morris for letting us get the grand tour of The Arm!